By far the two largest groups of socialists in the world are in China, in the tradition created by Mao Zedong, and in Latin America – the followers of Fidel Castro. Dialogue between these two currents is therefore of critical importance for the future of socialism in the world. The following article by Ajit Singh outlines the analysis of China by Fidel Castro. This issue is of great importance to socialists throughout the world but in particular to the left in Latin America at the present time. Following the election of Hugo Chavez as President of Venezuela, and the successful defeat of the right wing coup d’etat in that country in 2002, a wave of victories of left wing forces occurred across most of the Latin American continent. These governments then had great achievements in ensuring that the benefits from the commodity price boom that lasted up until 2014 went to the people of Latin America and not merely to elites within their countries and banks in the US. Living standards rose and there was a dramatic reduction in poverty and inequality in Latin America – a real ‘revolution in distribution’ took place. But in 2014, when commodity prices began to fall, one of the after effects of the international financial crisis, the Latin American left wing governments were not able to respond adequately to downward pressures on major economies such as Argentina, Brazil and elsewhere – they were not able to make a ‘revolution in production’. This was despite the fact that China and Vietnam were simultaneously coming successfully through the international financial crisis with scarcely any slowdown in their economies. But left wing forces in Latin America had paid insufficient attention to studying and learning from China’s enormously successful economic policies – including the world’s greatest poverty reduction programmes. This mistake was aided by influence of Western socialists, whose writings show that they did not in fact understand Marx, who claimed China was a capitalist country and therefore the left should not study it. The confused views and proposed policies of such writers therefore did damage to the Latin American left. It is therefore crucial that the views of a socialist leader such as Fidel Castro on China are clearly understood. Ajit Singh clearly outlines Fidel Castro’s analyses of Cuba and its importance for developing countries. 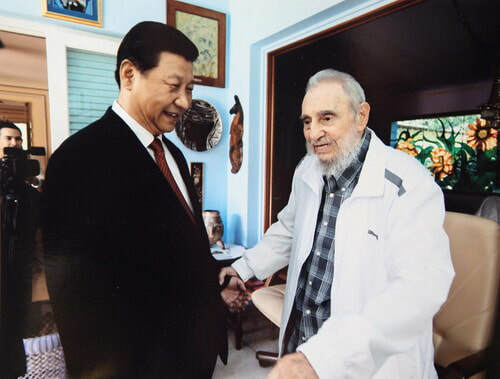 Fidel always firmly maintained his support for China and believed that the Communist Party was genuinely and capably pursuing revolutionary socialism. This Saturday marked the first year anniversary of the death of Cuban revolutionary leader Fidel Castro. Around the world, progressives and revolutionaries commemorate his life and continue to be inspired by his example. Often prescient, Fidel continues to be a source of insight for understanding today’s political landscape, including the defining feature of the 21st century: the rise of the People’s Republic of China. Since 1978, China has implemented economic reforms in order to overcome its severe underdevelopment — historically imposed upon it by Western and Japanese imperialism — and the monopoly over technology held by the imperialist powers. Following their introduction China has achieved unprecedented economic growth, building a modern, moderately prosperous country and becoming the second most powerful economy in the world. Although the Communist Party of China has always insisted that it remains committed to Marxism and socialism, the reforms have been considered by many — particularly in the West — to be an abandonment of socialism for capitalism. Fidel, however, always firmly maintained his support for China and believed that the Communist Party was genuinely and capably pursuing revolutionary socialism. In a 1994 interview, Fidel stated: “If you want to talk about socialism, let us not forget what socialism achieved in China. At one time it was the land of hunger, poverty, disasters. Today there is none of that. Today China can feed, dress, educate, and care for the health of 1.2 billion people. “I think China is a socialist country, and Vietnam is a socialist nation as well. And they insist that they have introduced all the necessary reforms in order to motivate national development and to continue seeking the objectives of socialism. “There are no fully pure regimes or systems. In Cuba, for instance, we have many forms of private property. We have hundreds of thousands of farm owners. In some cases they own up to 110 acres. In Europe they would be considered large landholders. Practically all Cubans own their own home and, what is more, we welcome foreign investment. In 2004, Fidel awarded Cuba’s state honor — the Order of José Martí — to Hu Jintao, then President of China and General Secretary of the Communist Party. At the ceremony, Fidel expressed his admiration for the achievements of Chinese socialism: “The significant thing, the extraordinary thing for me and for the world, is that the legendary China, one of the first and richest civilizations and the most populated country on Earth, less than a century ago was a territory occupied and cruelly exploited by the powers imperial of that time. Millions of people died of hunger every year; rivers of Chinese blood ran through their fields and cities. Imperialist expansionism and brutality were raging against that noble and generous people. Injustices and inequalities rooted for thousands of years seemed destined to last forever. “Socialism will definitively remain the only real hope of peace and survival of our species. This is precisely what the Communist Party and the people of the People’s Republic of China have irrefutably demonstrated. They demonstrated at the same time, as Cuba and other brotherly countries have shown, that each people must adapt their strategy and revolutionary objectives to the concrete conditions of their own country and that there are not two absolutely equal socialist revolutionary processes. From each of them, you can take the best experiences and learn from each of their most serious mistakes. “The Chinese process counted, in addition, with the contributions of great and brilliant political thinkers, who continued to develop and enrich the doctrines of socialism. “China has objectively become the most promising hope and the best example for all Third World countries. I do not hesitate to say that it is already the main engine of the world economy. In what time? In only 83 years after the foundation of its glorious Communist Party and 55 years after the founding of the People’s Republic of China. “The relations between China and Cuba are today an example of transparency and peaceful collaboration between two nations that hold the ideals of socialism. “Today there is not only a solid basis for the development of relations between the two countries, but also a greater political will to deepen them, continue to expand them, and defend the noble cause of socialism, unity among peoples and respect for the principles of international right. “The role that China has been playing in the United Nations Organization, including the Security Council, is an important element of balance, progress and safeguard of world peace and stability. Fidel rejected as idealist and utopian, the notion put forward by many that China has failed to conform to preconceived notions of a “true” socialism. Having led a socialist country in the Global South at the front-line of imperialist aggression, Fidel understood and respected that socialist countries had to respond to the concrete conditions and challenges which they faced and not merely apply dogmas. Internationally, China strives to play a leading role, promoting cooperation, peaceful development, and environmental sustainability to build a multilateral, more democratic international order. China works with countries in the Global South, providing beneficial alternatives to imperialism and promoting independent development and empowerment. As China enters a “new era,” it is definitively leading the struggles against imperialism, climate change, and inequality, and for peace, sustainable development, and socialism. There is much which can be learned from Fidel in how to understand, respect, and demonstrate genuine solidarity with this revolutionary country.